Pilates is one of the most adaptable methods of fitness in the world which makes it perfect for the aging body. Exercises can be modified for each student, while still emphasizing strength, balance, flexibility, muscle tone, stamina, and confidence. The Pilates apparatus is extremely supportive, allowing for entire sessions to be completed while laying down or in limited planes of motion. In addition, the mind body connection of Pilates has been found to improve memory and cognitive skills, both things especially important as we age. 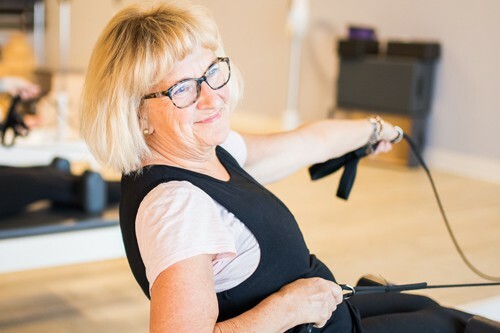 Whether you’re looking to recover from a knee or hip replacement, a torn rotator cuff, or more, Pilates is one of the most adaptable methods of therapeutic exercise to get you back to healthy movement. Pilates focuses on correcting muscles imbalances, many of which are the causes of injuries. By strengthening underdeveloped muscles, more muscle and joint balance is achieved in the body, leading to healthier movement. In addition, Pilates is extremely supportive, allowing for entire session to be performed while laying down, or on one side or another. Finally, Pilates teaches proper movement, allowing a student to learn what they need to work on in their own body beyond their rehabilitation. Pilates focuses on strengthening your abdominals, back and pelvic floor muscles without straining or stressing your joints. These muscle groups are critically needed during and after the birthing process for proper healing and returning to normal physical activity. With Pilates during and after pregnancy, you can build a better core, reduce back pain, strengthen your pelvic floor, improve your balance, relax and control your breathing. Pilates helps ensure a more successful delivery and recovery following the birth of your little one. In the mid twentieth century, many dancers sought out Joseph Pilates in NYC to rehabilitate post injury. In turn, many of the classical Pilates exercises we know today are based upon ballet and modern dance movements that Joseph Pilates developed to strengthen his dancer clients. Pilates is the natural method of cross training for dancers as it focuses on deep core support, pelvic alignment and range motion, while emphasizing controlled full-body movement. Our men’s program is built to help men strengthen neglected muscle groups, improve flexibility, and build core strength. We focus on relieving back and joint pain on the Pilates reformer, while still working towards increasing strength in both smaller and large muscle groups. We have an emphasis on release work, in addition to working on movements to improve rotational sports, such as tennis and golf. Improve your posture, movement, and more in our popular series.